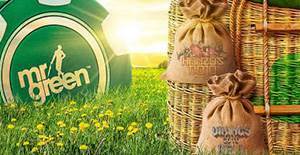 This week, you can find yet another interesting promotion at Mr Green Casino: the Up and Away €10,000 Cash Drop. This casino promotion will distribute 100 random cash prizes worth a total of €10,000 into randomly chosen participating player accounts. In order to take part, you have to play any of the slots Vikings Go To Hell, Hanzo's Dojo and Golden Fish Tank with a minimum real-money bet of €0,75 per spin. Any spin will give you the chance to win one of 100 random cash prizes, with the top prize of €1,500. If you happen to win a prize, it will be credited automatically to your player account. The prizes are real cash and not subject to wagering requirements. Keep in mind to read the promotional terms and conditions, general terms and conditions also apply. Only players from eligible countries can participate. To see if you are eligible, visit the casino. Visit Mr Green and Check Out the Promotion! The established online casino Mr Green, with their mascot wearing a green suit, has gained huge popularity with players in recent years. Reason for the success are the fair terms of the casino, reliable payouts of winnings, an interesting and ever-growing game selection of many developers, as well as changing promotions every week. You can read more about everything the casino has to offer in our Mr Green review, or take a look at our Mr Green Casino FAQ.